The worlds’ No.1 tool on cleaning up and repairing info for both iTunes music library and external music library on Mac. 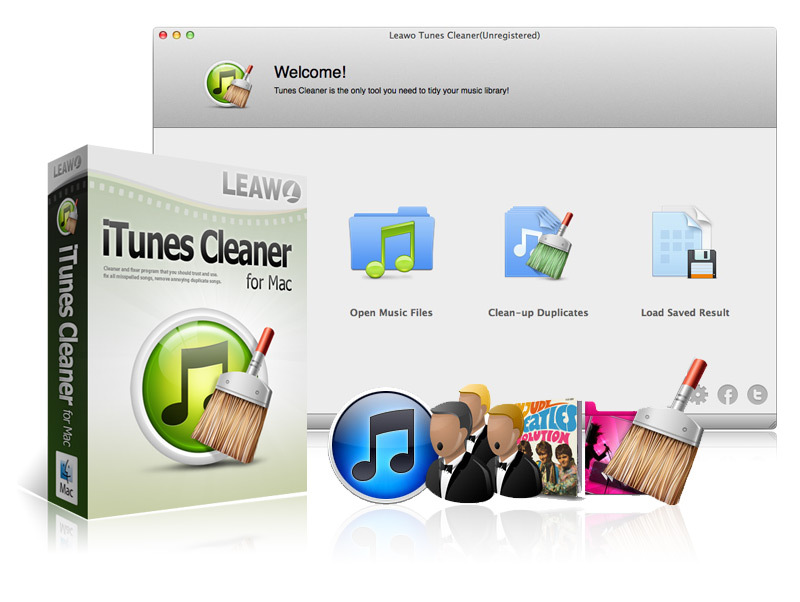 Leawo Tunes Cleaner for Mac is a smart and the simplest iTunes cleanup tool to seamlessly clean up, reorganize and repair iTunes music library and external music library in few simple clicks. It could not only detect and delete duplicates in iTunes and other music folders to make your music collections well-organized, but also delete songs that have no source files in music library. It could get album artwork, add missing music tags including artists and album, and add music tags to complete music info manually, etc. What’s more, this iTunes cleaner program is smart enough to perfect and complete music info on basis of existing music tags. * Simple and clear navigation buttons on the home interface: Start to Clean iTunes, Open Music Files, Clean-up Duplicates and Load Saved Results. * Quick Scan and Deep Scan modes ensures more accurate scanning and deleting results. * Download and add music tags including song name, artist, album and album artwork automatically through powerful online music database. * Acoustic Fingerprint technology scans, detects and deletes song duplicates in iTunes music library or other music folders automatically, easily and accurately. * Manual music tag editor allows manually fix music tags of unrecognized music files. * Unique scoring system automatically scores iTunes library before and after iTunes cleanup work to display iTunes library health condition. * Apply fixed music info to iTunes music library or original music folders in just one click.